We are our own tribe, bonded by our kinship, with a sense of creativity at its heart. Our purpose has always been to champion ability over any perceived disability. There is beauty in difference if you remove judgment. Our clay community has created its own collective purpose, generated genuine friendships and has nurtured an environment that has empowered countless individuals. 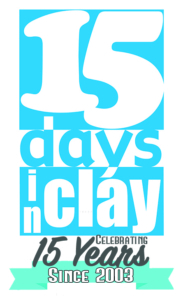 What Does 15 Days In Clay Mean to You? This question was the starting point to the brainstorm, with reoccurring themes emerging. Collective strength, unity, creativity, biscuits! Somehow we needed to visually convey this message. We are our own TRIBE. The work needed to create a sense of presence, stature and an interaction. There needed to be uniformity with the overall form, but individuality in any artistic expression. The original question was just a guide. The component parts were to be given their own life. Each part was worked on separately. There was great trust given to the process and serendipity. The “one eye” was to detract from focusing on a face, so the figures become experienced. In short, two eyes will make a face one eye makes a figure! After this exhibition Tribe will continue with a physical journey. SO WELCOME TO TRIBE, A GLORIFICATION AND CELEBRATION OF 15 YEARS WORKING WITH CLAY! To all of the extraordinary artists, teachers, volunteers, supporters and friends a huge thank you. Janna Edwards Founder of 15 Days in Clay.